A compelling destination for the wildlife enthusiasts, Periyar National Park at Thekkady is a premier travel attraction in Kerala. Located in the soaring hills of the Western Ghats, the park occupies and area of 777 sq km in the Idukki and Pathanamthitta districts of the state. The landscape is filled with lush vegetation, deciduous forests, grasslands that make up a rich biodiversity hotspot. Here you can spot an array of animal species including elephants, tigers, bison, wild boar sambar and langur in their natural habitat. 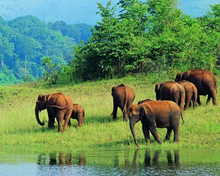 Though proclaimed a Tiger Reserve in 1978, Periyar National Park is famous for large number of elephants. The park is home to 62 species of mammals, 42 species of fish, 27 species of amphibians, 45 species of reptiles and more than 265 species of birds. The confines of the park also support invertebrate orders such as Protozoa, Annelida, Arthropoda and Mollusca. The park is haven for sambar, gaur, nilgiri tahr, Malabar giant squirrel, porcupine, barking deer, nilgiri langur, monitor lizard, flying lizard, flying frog, king cobra, flying snake, python, striped necked mongoose, flying squirrel, nilgiri marten, fruit bats. 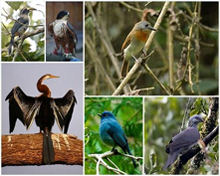 You can spot birds such as flycatchers, blue-winged parakeet, darter and grey hornbill etc. Manakkavala, Periyar Dam, Crusoe Island, Pavarasu, Mullakudy and Thannikudy are some of the nearest picnics spots from Periyar National Park. 4Km from the Park, Kumily is an important spice trading centre and handles a major share of the spice trade. The town is home to hotels, resorts and homestays for accommodation. Located at a distance of 5 Km from Thekkady, Murikkady is famous for plantation of coffee, cardamom, tea, pepper and other spices. Shalimar Spice Garden is the best accommodation option here. 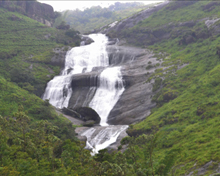 Pandikuzhi, 9 Km from Thekkady, is an important excursion site from Thekkady. A favourite haunt of the picnickers for its exotic flora, fauna and gushing streams, Pandikuzhi is visited by the adventure souls. 18 km from Thekkady, Chellarkovil is another beautiful place which commands stunning view of the plains and cascading waterfalls. This sleepy little village with its breathtaking view of the plains & cascading waterfalls is a feast for the eyes. Manayath Heritage offers accommodation facilities. Located at a distance of 15 km from Thekkady, this old shrine is located in the dense woods on the top of a peak. At an altitude of 1337 m above sea level, the shrine can be visited only on the Chitra Pournami festival day. 18 Km from Thekkady, Vandiperiyar is amajor trading centre of tea, coffee and pepper. Located on the banks of the Periyar river flowing through the centre of Vandiperiyar the place is home to a tea factories. Periyar Reserve Bungalow and Thondiar Estate Bungalow can be availed for accommodation. 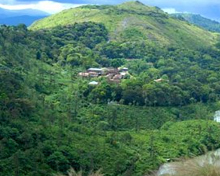 25 Km from Thekkady, Vandanmedu is located an altitude of 4000 ft above sea level. The place is the largest producer and auction centres of cardamom in India and I is home to many tea and spice plantations. Carmelia Haven Hotels & Resorts is the accommodation option at Vandanmedu. Deriving its name from the Sufi saint Peer Mohammed, Peerumedu is a hill resort on the way to Thekkady which is 40 km away. Located at a height of 914 mts, Peerumedu is home to coffee, rubber, pepper and cardamom plantations. The tomb of Peer Mohammed, a close aide of the royal family of erstwhile Travancore princely state, is an attraction here. The summer palace of the Travancore royal family and the residence of the diwan are the places of interest at Peerumedu. Other attractions include Thrisangu Hills, Peeru hills, 17th century CSI Church, Parunthupara, and Panchalimedu. Hotel Himarani is the accommodation facility at Peerumedu. 43 Km from Thekkady, the hill station of Pullumedu commands a breathtaking view of the lush green rolling hills. From here one can have a view of the renowned Sri Ayyappa temple at Sabarimala. 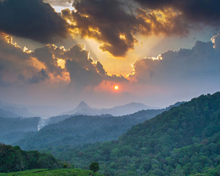 Located at a distance of 43 Km from Thekkady, the picturesque Gavi is a haven for those looking for adventure pursuits. Trekking, boating, bird watching and camping are available here. Green Mansion run by Kerala Forest Development Corporation is the accommodation facility. A centre for trekking and adventure activities, Kuttikkanam is 48 Km from Kuttikkanam. Misty Mountain, Thrisangu Haven, Paradisa Plantation Retreat, Dreamland Hill Resort and Tea Valley Guest House are accommodation options at Kuttikkanam. The renowned forest shrine Sabarimala, dedicated to Lord Ayyappa, is located within the confines of Periyar Tiger Reserve. Accessible only by foot, the temple attracts thousands of devotees every year during Mandala Pooja (November/December) and Makara Vilaku (January). The shrine is off-limits for women aged between 10 and 50. 70 Km from Thekkady. Vagamon is a hill resort to escape the heat. Synonymous with tranquility, this hillside village is home to a dairy farm run by the Kurisumala monks. Vagamon Heights is the accommodation facility here. Located at an altitude of 1,600 metres, the picturesque hill-station of Munnar is 113 km from Periyar National Park. With a lovely climate, rolling hills with tea estates, gushing waterfalls and an unhurried pace of life, Munnar is situated at the confluence of the Muthirappuzha, Chadavurai and Kundaly rivers. Bus services are available from Thekkady to Munnar which is 105 km from Cochin. By Rail: Madurai (140 km) in Tamil Nadu and Kochi (190 KM) in Kerala are the convenient airports. By Rail: The nearest railhead to Periyar National Park is Bodinayakanur (67 Km). However, Kottayam (114 Km) is the convenient railhead. By Road: Thekkady is connected by motorable roads with all the important places in South India. Bus services are available from the park to Kochi, Munnar, Thiruvananthapuram, Idukki, Kottayam and Madurai. Some of the cities and places connected with the park are Alleppey (164 km), Idukki (66 km), Munnar (113 km), Kottayam (114 km), Madurai (140 km), Kodaikanal (160 km), Kochi (190 km), Kollam (220 km), Thiruvananthapuram (272 Km) and Ooty (394 Km). Hotel Aranya Niwas, Hotel Lake Palace, Periyar House, The Bamboo Grove & Jungle Inn, The Elephant Court, Hotel Kumily Gate, Michael's Inn, Muthoot Cardamom County, Hotel Sithara, Mas Lake Queen Hotel, Mukkumkal Hotel Regent Tower, Hotel Treetop, Silver Crest, Holiday Home, Mukkumkal Tourist Home, Hotel Ambadi, Woodlands Prime Castle, Green Woods, Jungle Village and Meadow View Inn are some of the accommodation facilities in Thekkady.